Problem: After time, concrete moves and lifts. These homeowners were concerned that their heavily used walkway was beginning to slope towards the home. Solution: We raised and levelled the sunken concrete with Polylevel and graded the walkway slightly away from the home to help direct water away from their upcoming landscaping project, and basement; helping to eliminate potential water penetration. Hi there, I have some sill plate rot and the end of beams rotted and was just wondering if I could get a quote to fix and spray foam. 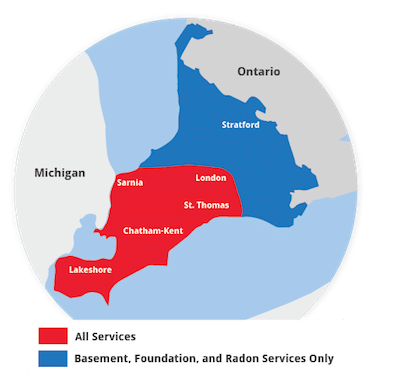 My Radon test just came back with high levels and I would like a quote to have areas repaired. Wondering what it would cost to get crawl space encapsulated to help keep living space warm/cool and heating/cooling costs minimal. Everyone was fantastic and the quality of the work was excellent. "Everyone was fantastic and the quality of the work was..."
"From the moment I called I was happy. The lady who answered..."
We not only adhere to the highest industry standards, we strive to be the industry leader in the home improvement related services we provide. We also use state-of-the-art products and technology which are designed to fix your home. We are the authorized Basement Systems dealer in Harrow, ON. The sidewalk is now graded to direct water away from the home. This sidewalk is great shape: just beginning to slope towards the home. Looking for a quote for cottage crawl space. I would like an estimate for sealing my crawl space from any moisture. We have a dirt floor in the crawl space. I am easier to reach by email please. Occasional minor seepage of water in our laundry room and grade-level entrance area if there is a heavy rain or when it rains several days in a row. Basement has 2 leaks, 1 in crawl space and the 2nd beside our fireplace. I have a leak in my cellar whenever rain or snow pool on my front porch. Looking for some solutions.